I found Sheila Simonson’s Lady Elizabeth’s Comet, a Regency romance in the traditional, chaste seventies-and-eighties style, to be among the best I’ve ever read. The author has obviously done her research, which shows in the liberal use of period cant (slang) and the careful attention to detail–especially the attitudes and prejudices of men towards women, of proper aristocrats towards those who have “slipped,” and of the way that children were raised by governesses and proxies rather than their own parents. As a heroine, Lady Elizabeth can seem rather unsympathetic. Like Elizabeth Bennet in Pride and Prejudice, she makes assumptions about the two men of interest who enter her sphere–based more on their address than their inner qualities. Her apparent neglect of her sisters and her prickly and sometimes selfish behavior are amply justified by the walls she has had to erect due to her “unwomanly” pursuit of knowledge. Unlike Pride and Prejudice, neither Lord Bevis nor Lord Clanross are bad men. Their faults and virtues instead derive from much more personal places. As potential heroes, both have promise. Neither is truly unkind. Lord Bevis (who, rather obviously, is not the true hero of the book) is in love with a fantasy–a memory of the girl he knew five years earlier–and finds her intellect to be an impediment that is hard to take seriously. Lord Clanross is a different kind of man. Sent into the army as a youth, degraded in the public eye by having worked as an estate manager, and filled with radical ideas, he is an exceptional hero. He is not your typical “prince of the Ton.” Instead, he is a practical, thinking man who is not exactly sure how to reconcile his past experiences with his unanticipated, exalted position and all of the parasites and political responsibilities it entails. Lady Elizabeth’s intellectual pursuits and personal integrity play a central role in the story. Her growth from self-centeredness to a more generous attitude is believable and well-developed. And her compatibility and chemistry with the hero is exceptional. How came I to feel so strongly? . . . It happened, I reflected, after he started walking the grounds and bathing in the lake and began to feel better and look less wan and sleepless. It is a dreadful thing for a woman of intellect to admit so physical a criterion for love. I wanted to evade the fact but there it was. I was a mere animal after all, drawn by a bright eye and a healthy complexion. Alas. I knew I had persuaded myself to love Bevis the better because he was beautiful. Clanross was not, but he was now far from being an antidote, and he had very fine eyes. And excellent shoulders and well-shaped, long-fingered hands, and a pleasant voice, too (174–5). To me, this is a beautiful moment because it is a frank self-evaluation by the heroine. Moreover, her acceptance of her own earthy nature and her gradual revaluation of the desirability of Clanross (including the catalogue of his sexier features as well as his personal qualities) is truthful and real. Before, she believed she was above it all. Now, she brings herself down to earth for the first time in her life. After all, she has a problem to solve: how can anyone make a man love them? If Simonson’s book has a weakness, it is in its secondary characters. Often, they are sketched in so that the focus remains on Elizabeth, Clanross, and–to a lesser degree–Bevis. Sadly, Elizabeth’s twin sisters (Jean and Maggie) are not as developed as one would like. Neither is Lady Elizabeth’s obligatory female companion, Alice.This flaw is, I suppose, a side-effect of the heroine’s preoccupation with herself, her research, and her concerns about Clanross, however. 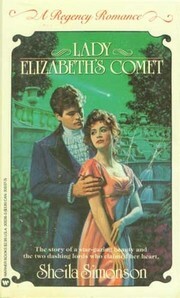 Unlike most Regencies, Lady Elizabeth’s Comet is told in the first-person, which means that our perspective is skewed. Elizabeth is interested in little beyond her telescope, therefore she is not observant of her fellows. Refreshingly, the best secondary character–perhaps because her eccentricities appeal to Elizabeth–is Miss Bluestone, governess to Maggie and Jean. For once, we get a governess who is not a twenty-something, barely-qualified, inexperienced heroine who somehow, despite all odds, triumphs with difficult children. Instead, we get a forty-year-old spinster with the beginning of a mustache. She is experienced, competent, shrewd, and passionate about her own intellectual pursuits (botany and fossils). If Lady Elizabeth were not wealthy, she could have become a Miss Bluestone. I could (obviously) go on and on about Lady Elizabeth’s Comet, but by now I think my point is clear. If you want an unusual, thoughtful Regency romance and are willing to tackle both first-person narrative and a slightly challenging read (due to the accurate slang), this is the book for you.